We are now down to the final 50 players in the $400 Mega Stack Challenge. 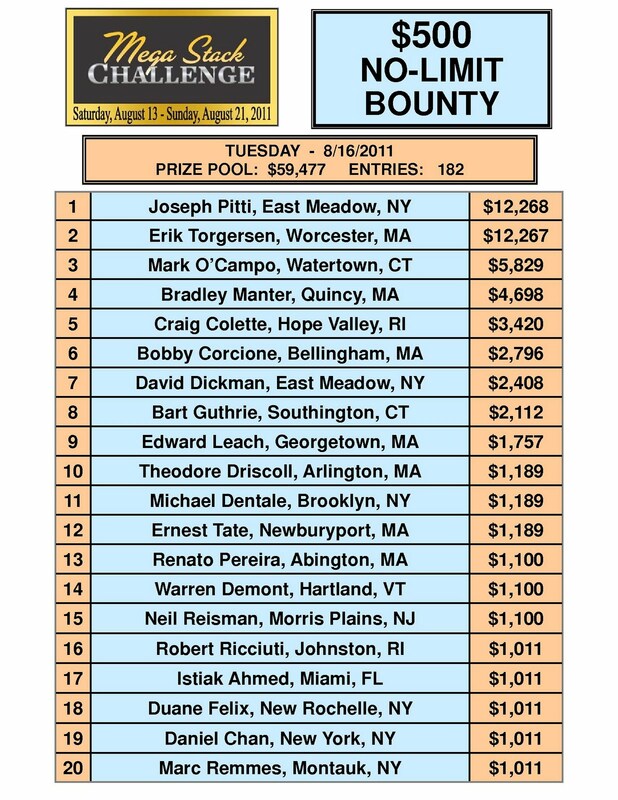 All players are officially in the money and guaranteed at least $845. The blinds are now 4,000-8,000 with a 1,000 ante. The average chip stack is now just over 184,000. The players in the $400 Mega Stack are now on a 10-minute break. When play resumes the blinds will be increased to 4,000-8,000 with a 500 ante. 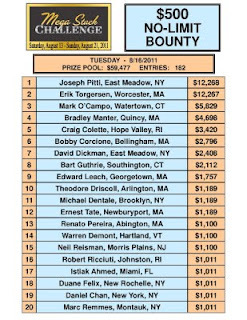 With 85 players remaining, the average chip stack is just over 108,400. Play has resumed after the dinner break and the blinds are now 1,200-2,400 with a 300 ante. 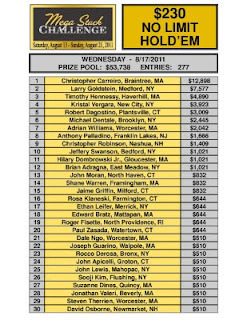 There are officially 144 players remaining and the average chip stack is now 72,600. The players in the $400 Mega Stack Challenge are now on a one-hour dinner break. With approximately 144 players remaining, the average chip stack is now just over 64,000. There are now less than 200 players remaining in the $400 Mega Stack Challenge. The blinds have been increased 800-1,600 with a 200 ante. The average chip stack is now just over 47,000. The players have just resumed play after a 10-minute break. With 330 players remaining, the average chip stack is now just under 28,000. We had a total of 461 players in the $400 NLHE Mega Stack Challenge event. $400 Mega Stack Now Streaming Live! 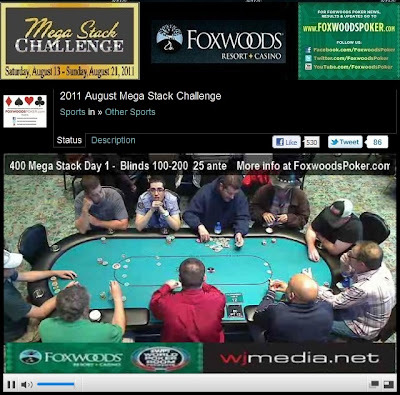 Day 1 of the $400 Mega Stack Challenge is now streaming live. Just click "Watch LIVE Video" at the top of the page to view the live feed of the feature table. Final numbers and payouts will be available momentarily. Over 400 Already In the $400 Mega Stack! 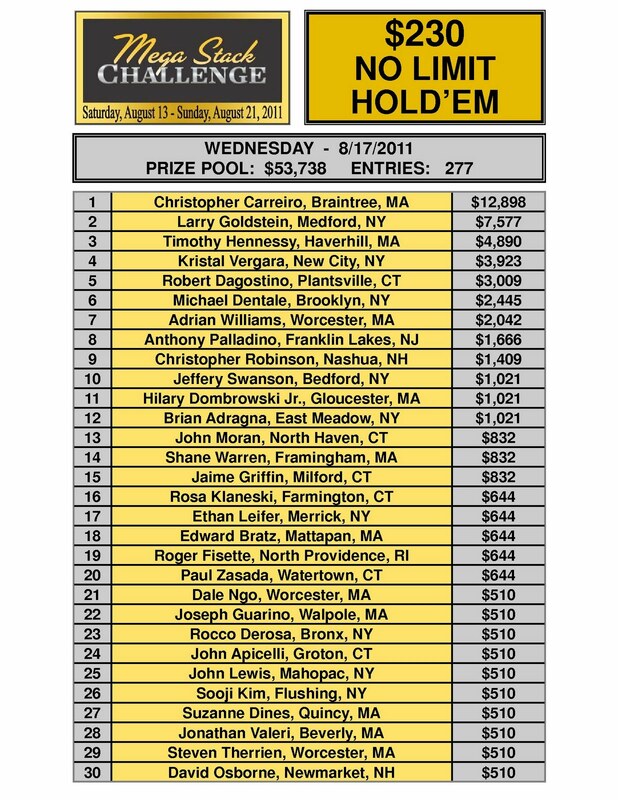 With registration still open, there are now over 400 players entered in today's event. $400 Mega Stack Challenge Now Underway! The $100,000 guaranteed prize pool $400 N0-Limit Hold 'em Mega Stack Challenge event is now underway. Players start with 20,000 in chips and the Levels 1-12 are 30 minutes in length. Levels 13 and up are 40 minutes in length.